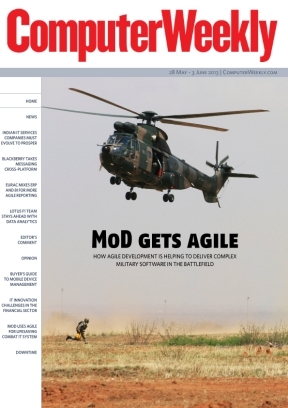 In this week’s Computer Weekly, we find out how agile development is helping the UK Ministry of Defence deliver complex military software for the battlefield. The CIO of the Lotus Formula One team explains the importance of data analytics to winning races. We examine how the strategies of Indian IT services providers need to adapt to a changing outsourcing market. And we look at the IT innovation challenges facing financial services firms. Read the issue now. How the Ministry of Defence used an agile development framework to manage the creation of a combat IT system for the British armed forces. Finance firms need to overcome their fears of regulation if they are to innovate and IT must be ready to support them when they do, according to IT leaders from the financial services sector. With Microsoft’s dominance of enterprise IT increasingly threatened by the growth of cloud, consumer technology and bring your own device (BYOD) strategies, the software giant is pushing harder with its own products for mobile device management. In making the BBM messaging service available on iOS and Android, BlackBerry is acknowledging the changing mobile environment in which it has to compete. When the IT department at European brake manufacturer Eurac gave an intern some free software to play with, it did not expect the result to be a new business intelligence (BI) dashboard across the company. Byte Night founder Ken Deeks hopes Friday 4 October will be one of the most monumental nights in the history of the IT charity sleep-out, with a fundraising target of £1m. This week's issue is sponsored by AppSense.